At the risk of sounding sacrilegious I'd like to confess something that may draw audible gasps from my Korean and Korean food loving friends . Well, that's not entirely true. I should say I'm not that into pork. Yes, I cook it. Yes, I'll go out and eat it with friends without many problems but having been born and raised in the States where beef is king, the moo moo animal is still, hands down, my favorite creature of the entire animal kingdom that I consume. Steak, burgers, ribs and whatnot... I've even shared with my friends that if it wasn't for beef, I could become a vegetarian if I absolutely had to for whatever reason. Now here in Korea, pork is undoubtedly the people's animal here. Pork is cheaper to raise in the mountainous and land space-limited Korean peninsula so pork is the more everyday person's meat while beef is relegated as a more "luxurious" meat for special occasions and special people since beef goes for roughly 4-5 times the price of pork here. Among pork, the most popular cut for Koreans is the belly, also known as samgyubsal (삼겹살). These fatty cuts can be prepared in a number of ways but one of the most popular method of cooking it (if not the most popular way) is cooking it up on a grill with garlic, kimchi, onions and other fixings and with a bunch of side dishes, jjigae (stew) and all the fixings over soju. What's one of a Korean kid's favorite things to eat out with his/her family? Samgyubsal. What's probably the most popular place everyday for thousands of Korea's company employees to start off their company outings after work? Samgyubsal. What's one of the most popular places for university students and young adults to meet up with their friends on weekends? Samgyubsal, once again. Now, as I mentioned before, since I'm not as crazy about pork I stand out against the masses for my lower enthusiasm for pork. Nevertheless with everyone around you so into them, it's never too long in Korea before you have grilled up samgyubsal in front of you. Over the course of my four years here, I've had samgyubsal of all different kinds. I've had samgyubsal grilled in the fancy schmancy restaurants of gangnam, various fusion samgyubsal that's been marinated in wine or special herbs, smoked barbecue samgyubsal and on and on. But one samgyubsal joint that I visited over a year ago, and which I revisited recently, has come out as the hands down best samgyubsal place I've been in all of not just Seoul, but Korea (so far). A rather bold claim you say? Normally I'd agree with you too but look, just go to where I'm introducing you to in this post and then let's talk. You'll thank me later. Tamradon over near Hongik University is already no big secret especially to those living near the area. Tamna is actually the old name of Jeju Island which even used to be its own independent kingdom at one point in Korean history while "don" is the Korean pronunciation for the Chinese character for "pig". Jeju's pork has long been prized and regarded as the best in Korea and, as the name would suggest, Tamradon specializes in Jeju pork. Jeju pork is, of course, nothing new in Korea but as various investigative reports have confirmed, many barbecue restaurants claiming to serve Jeju pork have been revealed as fakes. Not so at Tamradon where, every other day, fresh pork direct from Jeju Island is flown into Gimpo airport which the restaurant directly picks up for their supplies. I came across this place on Wingspoon (a Korean version of Yelp) on my phone a year ago as my friends were (unsurprisingly) in the mood for samgyubsal yet again. The Hongik University area is notorious for some pretty bad samgyubsal places which targets university students with cheap prices and, ultimately, cheap meats. The meat you get at these places are often frozen or old pork cuts with more fat than meat. Determined not to have another similar experience, I looked up places and came across Tamradon and was impressed by the reviews. So much, in fact, I was a bit skeptical in wondering if the place had used its own employees to fluff up its ratings. 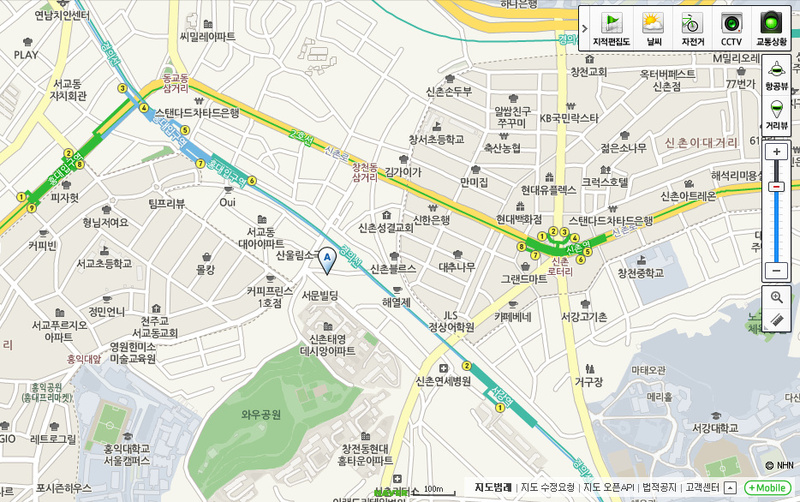 That "A" in the middle of the map above marks the location of Tamradon and as you can see, it's located in an odd place... not quite near the stations of Hongik University or Sinchon. So whichever of the two stations you come from you'll have to do some walking and add to that the fact Tamradon is located in an alley behind a major street making it a bit difficult to find. HOWEVER, friends and readers, I urge you not to let such petty things stand in your way of palate euphoria- a little heaven in your mouth. 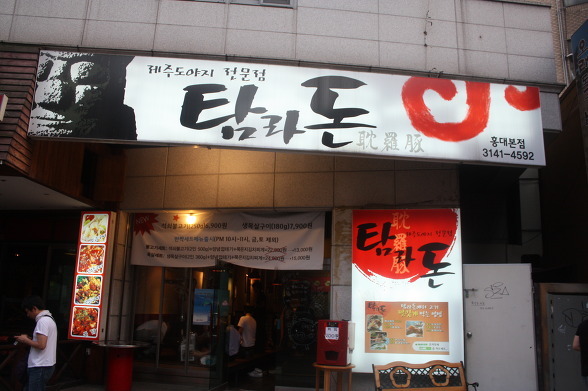 The joint is nothing too fancy looking and looks like your standard bbq place with your standard pork cuts- moksal (목살), gal mae gi sal (갈매기살), gabri sal (가브리살) and ogyubsal (오겹살). A quick lesson on the difference between samgyubsal and ogyubsal.... Both come from the same cuts and area of the pig, which is the belly. In the northern half of South Korea (including the central Chungcheonbuk and Namdo, Gyeonggido and Seoul, the preference is to eat pork belly with the skin, also known as the rind in the States, removed beforehand. With those extra layers removed this is where the "sam", which means "three" in Korean, comes from. However, in the southern parts of Korea, including Jeju Island, the general preference is for the skin on, and thus you have the "o" in ogyubsal which means "five", referencing the thicker meat. The bean paste stew is good but nothing too memorable. The kimchi is excellent. It's actually extra fermented kimchi (called "mook eun ji" in Korean) that's been washed out so you get all the punch without too much spiciness. It is excellent with the pork cuts with a bit of a sharp taste to cut into the fatty pork belly. The two sauces that accompany the pork is pretty unique at Tamradon. One is a tangy, slightly sweet, lemony sauce which is definitely more majority friendly. The other is actually a fish/seafood sauce which is how Jeju Islanders typically eat their pork with. This sauce, unlike the lemon sauce, takes a bit of getting used to and, unless you were born and raised somewhere by the ocean here, even the Koreans have a bit of difficulty adjusting to. Nevertheless, no matter which dip you end up preferring, the star of the whole place is the pork and pork solely. I really can't say enough about how perfect the pork is here. You can clearly see and taste that it's fresh, the thickness is perfect and you don't need any gimmick like wine or a special glaze or anything to improve on the meat. It's just great, high quality meat grilled up over charcoal which you can enjoy in multiple different ways- dipped in the special sauces, in a lettuce wrap, wrapped in the kimchi or just on its own. I'm not too big fan of the skin/rinds so I cut them off in the end and gave them to my friend who ate it all up but no matter which parts, it was unanimous by the parties I went with both times I went- this place is the bomb for pork belly. Now the other meat parts is quite good too. You can even order a special mix order of the different meat cuts. But the ogyubsal is what really stands out at this place and I can't stress enough that you must try the ogyubsal here if you come. Also on the menu as an accompaniment or palate cleanser at the end of your meal are two non-barbecue options: the kimchi mari guksoo (cold kimchi noodles) and kimchi jjigae (kimchi stew)- both 4,000 won. As a sucker for cold noodles, I've gone with the kimchi mari guksoo each time. Cold, sweet and tart. Yum. I found the noodle dish nice but some of my friends said the cold broth was too tart for their taste. I can't speak on the kimchi jjigae since I haven't tried it (yet) but if you're not too fan of tart tastes, the kimchi mari guksoo may not be for you! Another thing that impresses me about this place is the friendliness of the staff. Many restaurants, especially after they've become big and famous, will begin sliding on their service levels. After all, with Korea not having a tipping culture what's the incentive for the well-to-do eateries to be friendly to their customers.. but not so at Tamradon! Both times I've been the waitress have been super friendly (even during the busy dinner times) and the owner even came around the last time and helped grill up the meat for us and thoroughly explain any questions. I can't say pork has surpassed my everlasting love for beef but Tamradon almost makes me set my mind off the beef. Almost. Tip: The seats inside here are drum "cans" allowing you to safely put in bags, coats or any other items you wish to prevent from absorbing the barbecue smell. Also, this place serves Jeju's Halla soju. Many (myself included) have a fondness for the Halla soju so this is a good place to feel a bit like you're in Jeju away from Jeju!